Pancit or stir fried noodles is perhaps one of the most popular dish served in special occasions in the Philippines, it’s so popular most of the provinces have developed their own versions which features local ingredients. Several samples of this Philippine noodle dishes are the Pancit Palabok, Pancit Sotanghon and Pancit Cabagan to name some. If you look closely at each one them you will notice the use different cooking techniques, different type of noodles used as well as the use of different vegetable ingredients but all of them are served on a plate or a bowl and that what Pancit Habhab is known for, not using any plates or bowl. Yes you’ve seen it right no utensils! it is usually consumed in banana leaves by shaping the leaves like a half tube and slide down the pancit on one side then on to your hungry mouth. The serving vessel is what makes this dish unique and it is attributed to the street vendors of Lucban during the days when styrofoam and plastics are not popular, the disposable banana leaf was the hygienically ingenious way of serving this on the streets. 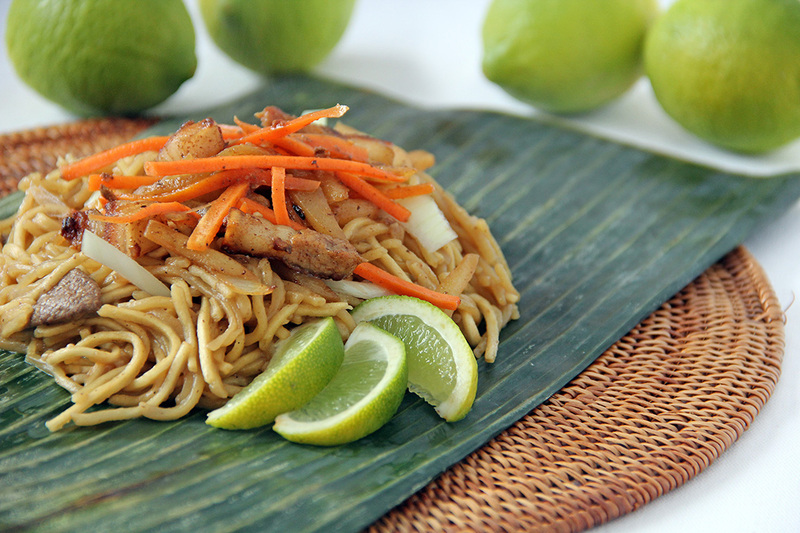 It also gives that distinct flavour as the hot pancit over the banana leaf would bring out the oil of the banana leaf. So if you will try this out I suggest serve it on banana leaf to get the real authentic taste. banana leaf, cleaned and passed through an open flame. In a large wok add around 1 tbsp oil, once hot enough add pork pieces stir fry until brown in colour. Add onion and garlic and stir fry for 2 minutes. Add carrots, chayote and liver and stir fry for 1 more minute, remove vegetable and meat from wok then set aside. Pour 3 cups of stock into the wok together with soy sauce, bring to a boil then add the noodles, cook for 5 minutes adding more stock if necessary. Add the vegetable back then mix to combine. Serve in banana leaf with lime wedges on the side. Looks yummy! Of course it has to have pork belly… 😀 How interesting to use banana leaf and bring it to mouth to eat. I haven’t had noodle without chopsticks/forks before. I think I’m skillful enough to enjoy Filipino style noodles! Oooh yay! As soon as I saw pancit in the title I got excited. Loved pancit buns in the Philippines! This habhab looks great too… mmm pork belly! And calamansi! I must have this! Would love to eat it out of a banana leaf! Sounds yummy and so handy. I love pork belly. I don’t believe I’ve ever had pork liver, however. The whole dish sounds terrific. Thanks. That image is making my stomach rumble. I’ve never heard of pancit habhab! Very interesting! Wish someone can cook a proper one for me here…! Looks delicious! I’ve got to try adding liver next time I make fried noodles. My very first Nanny for my children was from the Philippines and (it was so long ago) I’m sure she served us a dish on Banana leaves. I was expecting my second child and told her to cook her own food for us, not learn to cook our North American food. I’m certain I ate healthier that year than ever! Mmm I love a salty, spicy noodle dish! You know, even though this has pork liver in it, I really think I would love this dish! With all that garlic, vegetables and other flavors, it sounds wonderful and I love the idea of serving it in banana leaf! Pork belly again… oh my. Looks absolutely delicious. hmmmm…i think it is good..